But how many are? By the standards of the intense evangelical folks (“How is your walk with the Lord going today?”), most of the other people in the world who call themselves Christians don’t make the grade. Catholics are seriously off the mark, for example, as are those who consider themselves liberal or moderate followers of the faith. They’re just fakes. Any compromise of the Bible’s infallible status just won’t do. 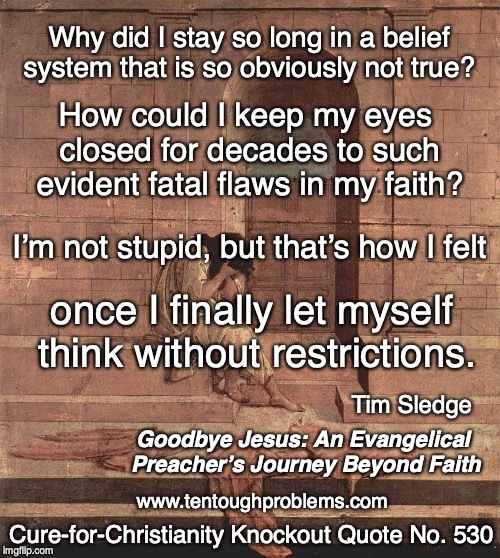 So how do True Christians explain it when a bona fide True Christian walks away from the faith? That is, someone who really did ‘belong to Jesus’? True Christians, usually at an early age, have prayed, “Dear Jesus, I am a sinner. Please come into my heart right now. Forgive me of all my sins, and take control of my life forever.” To abandon Jesus would imply that the Lord had failed; had somehow, inexplicably, lost his hold on the person. As another Christian said of me recently, “Must never have been saved, you can’t evict the Holy Spirit.” How could that possibly happen? It turns out that True Christians themselves can be at fault in ‘causing another to stumble’—actually in prompting someone in their ranks to finally see through it all and walk away. 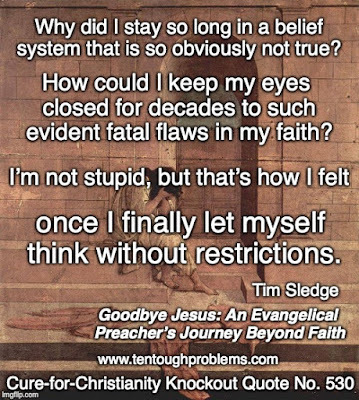 It would be difficult to imagine a truer Christian than Southern Baptist preacher, Tim Sledge, who describes his painful path way from belief in his 2018 book, Goodbye Jesus: An Evangelical Preacher’s Journey Beyond Faith. He cites that one-sentence prayer above, ending in ‘take control of my life forever’ as part of his journey into faith; he knew that God sent “Jesus and the Holy Spirit to live inside me.” And he explains how True Christians sabotaged his career, ministry, and faith. We’ll come to that, but there is much more to his story. On Twitter recently Sledge cautioned critics of religion against generalizing about the clergy, especially demonizing them all as purveyors of mystery and myth—and worse; which is all too easy in our era of sleaze televangelists and predator priests. Sledge’s book allows his readers to appreciate how pastors do indeed help the people under their care. It is absolutely true that he was deeply into born-again Christian belief, but he saw that many of those in his congregations were hurting—and theology alone was not a cure. Sledge ended up pioneering support group ministries, something unheard of in the Southern Baptist world. He authored a couple of books that were widely read and used by other denominations. So, yes, he was driven by his commitment to God and Jesus, but that doesn’t distract from his accomplishments. We can admire the expansion of this ministry addressing the profound pain and dysfunction that afflict even the folks who feel that they have been born again. “The people of Kingsland Baptist Church sensed that something was different in me, and that difference was drawing new congregants as our reputation began to shift and grow. We were becoming a refuge to people who were in pain and a welcoming place where they could find help. As believers, we had been taught to act as if Jesus had ‘fixed us’ when privately, many of us knew that we still felt broken. “The people who were touched by what I shared were typically people with decades of prayer, Bible study, and confession of sins under their belts. But they were still suffering, still acting out, still seeking something to ease their pain and improve their lives. They had tried the ‘God alone will fix it’ approach, and it had not worked.” Sledge was compassion-driven to do what he could to help people achieve wholeness. But how had be been so caught up in the drill of ‘prayer, Bible study, and confession of sins’ for decades? As was my own case, growing up in rural northern Indiana, that was simply the drill. It was the overwhelming cultural context in which I came to awareness of the world. I often speak of ‘faith brain damage,’ not meaning, of course, that physical damage is done. When beliefs entail huge emotional investment—which inhibits tampering with that investment—the damage is nonetheless real. And when the scare-factor is added, that is, the frightening promise that eternal punishment is the divine reward for rejecting Jesus, the faith can be well nigh unshakeable. But there was erosion—or potential for it—early on in Sledge’s religious journey. He makes repeated references in the book to “exceptions to the rule of faith” that he noted along the way: things that ought not be if believers have welcomed Jesus into their hearts. By almost any measure Sledge had been successful as the pastor of the Kingsland Church; there had been phenomenal growth, he received high grades on his annual reviews, and there were satisfying salary increases. He notes, however, that there were actually two congregations: the ‘forever’ members who wanted the focus on Bible, prayer, and confession of sins, but also the new members, the strangers, who had been attracted by the support group focus. He had also witnessed the intrigue and blatant dishonesty of a nearby mega-church that wanted to absorb the Kingsland church. The political ruthlessness—and his own exhaustion—left him with no desire to find another pastorate. He was on the exit path, although he tried for a long time to find a church home, without success; his faith eventually unraveled. •	“Once I stopped going to church, an odd thing began to happen. Although there were moments of sadness about the loss of fellowship, there were more moments of lightness. I felt as if my mind had been unshackled; a 10-foot-tall circular wall around my thinking was beginning to crumble. In the final chapters of the book, Sledge offers a few helpful tutorials on the problems presented by the gospels, Jesus, and the apostle Paul. It doesn’t take a seminary degree to figure these out; a commitment to reading the texts carefully, meticulously, critically is all that is required. Edging away from the faith—“Haven’t we been conned?”—is not an uncommon response. Hint to laypeople: your pastors and priests might not still believe all the crap they learned in seminary. There are now almost a thousand members of The Clergy Project, the online support group for clergy who have abandoned faith. They all have their stories to tell, and we can only hope they do so with the same eloquence that Tim Sledge has brought to the task. Goodbye Jesus is a welcome addition to this expanding shelf of books by the faith-experts who decided to walk away. There are so many contradictions, improbabilities, violations of common sense. There are too many yawning gaps, too much that is missing, for Christianity to make sense.